So why not join the party? (Oh, plus they also happen to quilt, as well). 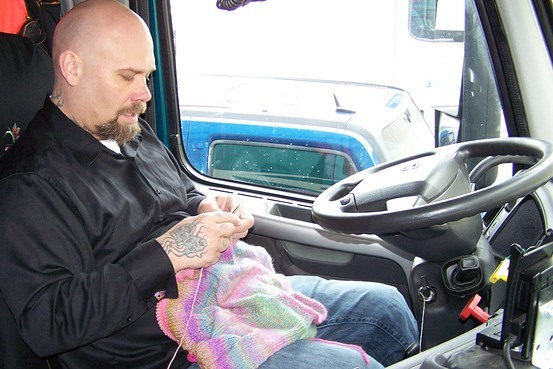 "Kevin Abraham-Banks, a 37-year-old trucker with a shaved head and dragon tattoos learned to knit last year after load-volumes slowed. Creating something tangible beats sitting around the truck stop 'talking about who has a bigger radio,' he said. He's finished a scarf and socks, and is working on a sweater for his wife. 'The fact that you can take strands of thread and basically make something out of it, that's awesome I think,' he said. 'It's pretty cool stuff, man.'"